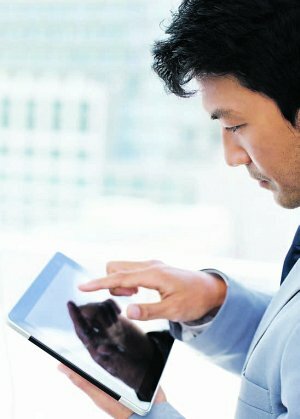 Touchscreens are now a part of everyday life and have become the default interface for smartphones and tablets. The versatility they offer adds new levels of interactivity to devices - they display information and let users resize text and pictures while virtual keyboards make it possible to create content easily. Follow these simple tips to reduce the risk of injury when working with touchscreens. 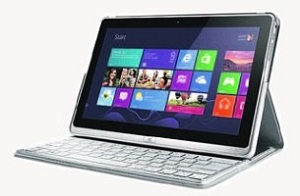 Most tablets and touch-screen notebooks are light and compact enough to be used in any position. This is convenient but it also means we tend to have poor posture when using them. Try to avoid bending your neck forwards or backwards, or tilting your head, for extended periods. This places considerable strain on your neck and spine and can lead to back problems. Holding a device in the same position for prolonged periods can cause strain, so take frequent breaks. If you feel any discomfort or numbness, relax your body and switch to a more comfortable position. Having a touchscreen keyboard and display on the same plane saves space, but poses a different problem. The best typing position is when the device is almost horizontal, like a conventional keyboard. But viewing content at that angle means your head will be bent forwards. If you’re typing for extended periods, consider a separate Bluetooth or WiFi keyboard that will allow you to find the optimal typing and viewing positions. Try not to use tablets and touch-screen notebooks under bright light. This causes plenty of glare, which makes it harder to view items displayed on screen. Constant use of a screen that’s perpendicular to the wrist forces it to be flexed for extended periods. This exerts greater pressure on the nerves in the hand, wrist and forearm, which could cause discomfort or even lead to carpal tunnel syndrome, so remember to give your wrist a rest. Risk of injury can be reduced greatly if users remember that touchscreen interfaces don’t require much force. Because touchscreens don’t provide tactile feedback like keyboards, users tend to apply too much pressure, straining their hands and wrists. Practise using your touchscreen to discover the minimum amount of force that is needed to manipulate objects on screen. High-resolution screens display stunning images. Text displays tend to be smaller since the screen contains more pixels in a given space. To avoid eye strain, enlarge the screen fonts to a comfortable size and take regular vision breaks. Touchscreen keyboards can be configured to different layouts. It may be worth trying different keyboard layouts - you may find a layout that’s more suited to certain types of apps such as games.